Full disclosure: A review copy of Las Vegas (in this case, Vegas Dice Game) was provided by Ravensburger Games. I keep being surprised by just the overwhelming number of Target-exclusive games that are coming out. I already took a look at Sunken Sailor and BONK, and now a … sort-of retheme of Las Vegas has come my way. It’s not quite a retheme in that they’re changing the actual game in any material way; I think it’s more a repackaging so that people who see it on the shelf have a better idea of what it is immediately. It’s kind of an interesting proposition. Anyways, it’s Vegas! Can you collect the most money? Or will you lose it all in the casinos? Resolve any ties. If multiple players are tied for any place (first, second, or further below), remove all dice belonging to those players from the casino. Ties are very, very mean in this game. Reward remaining players. In order from most dice to least dice, players take the highest-valued money card remaining in the casino. If there are no more money cards, the remaining players get nothing. And the money cards were $40,000 and $30,000, Red would take $40,000 and White would take $30,000 (as Green and Blue eliminate each other due to their tie). Once you’ve done that, reset the casinos like you did in Setup, and pass the Start Player card to the left. After four total rounds, tally up the money and the player with the most money wins! You can play with a variant at 2 – 4 players where each player gets the same number of dice of a color not in the game. That’s the neutral player. When you roll, you treat those dice as though they were yours — they get placed with your other dice and such. However, when scoring occurs, the neutral player is treated like another player! This means if they win, put the highest-value money card from the casino onto the bottom of the deck. That’s rough, but that’s how it goes, sometimes. At higher player counts you’ll see a lot more contention! People are going to be tying for casinos by mistake or fighting each other for control, and … that’s kind of the fun of the game, so lean into it a bit! You can play this at two, but then you’re kind of not getting into the thick of the game as much. I’d recommend this more strongly at four or five players, unless you give each player two sets of dice AND use the neutral player. It’s not bad, just, it’s going to be more fun at higher player counts. Slow and steady might win the race, sometimes. I’ve found that trying to put one die down each turn is a decent heuristic, as it lets you adapt to other players taking control of casinos. You’ll typically end up with more dice left than other players, which leaves you more options at the end of the round, since you can take a bunch of consecutive turns. Sometimes a power play is also good. If you roll out of the gate with 4 dice on the $90,000 casino, people are going to be a bit less likely to try and fight you on it. That’s good! Keep them away from your money. That said, even with four dice, it might not necessarily go your way. Watch out for bad luck. If you were, say, to get 8 5’s on your first roll, you must put all of them into the 5 Casino. This limits your options, somewhat. This also means that you may unavoidably hit a tie on one of your turns, as you’re forced to put all your remaining dice on a casino. 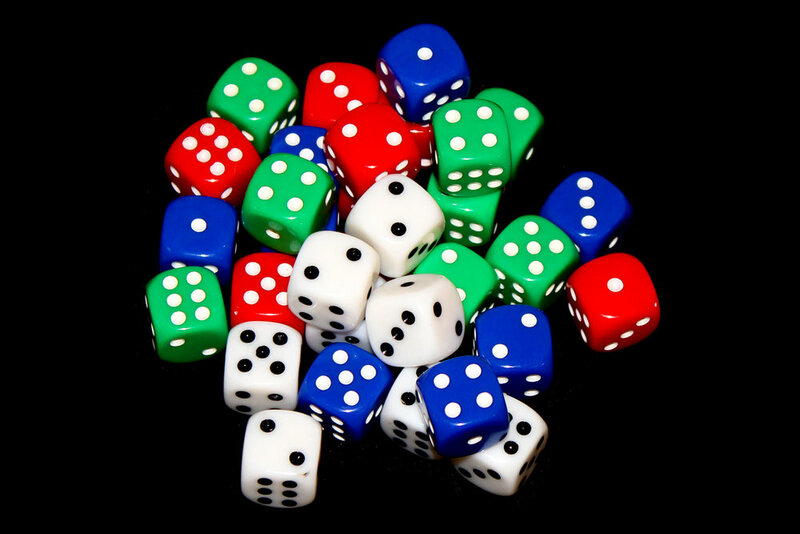 Naturally, the odds of losing all your dice in one roll is pretty low (1/6 ^ 7, on 8 dice), but that probability increases by a factor of six (tautologically) for every die you place on a casino. Feel free to table talk. If you can encourage another player to block someone, that’s strictly good for you. It knocks out both players. So get in there! Encourage other players to make bad decisions! Things like that. Try to get second or third, sometimes. It’s quite nice to only have to put one die on a casino and still get some money. If you spend 3 dice and get $60,000, that’s a lot more useful than trying to win the $60,000 in a casino and having to spend 5 or 6 dice. There’s a subtle art to it. Fast setup. It’s slightly more complex to set up than War, but, I mean, that’s fine with me. Easy to teach. I taught my family this over Thanksgiving. They really enjoyed it and we got it off the ground very quickly. Nice components. The dice / cards are nice and the casinos are solid, thick boards. All good things. Being solid at 4 – 5 players is always nice. As I mentioned with my Bemused review, it’s nice having games that play well at 5 players, as it gives you more configuration options for game nights. Fast play. It’s a quick game, making it a good opener / closer for game nights, especially because you can get spectators making peanut gallery recommendations and cheering when people take it all or lose big. Everyone gets some little victories. A thing I really like about the game is that win or lose, unless you have a really rough game, you generally win at least a few casinos here and there, meaning that everyone gets some victories over the course of a game. It’s not just a “you’ll be losing the entire time” game; it gives players the opportunity to be minorly successful, and if they’re consistently minorly successful they may be able to turn that into a major success. I think that’s a nice thing I don’t often see in games, but I definitely appreciate it. The box is … an odd shape. I 100% get why they did it that way — it looks great. It’s a die! The game is a dice game! It makes perfect sense. You can even roll the box (and you should). For people with … more free space on shelves, that’s totally fine. For me, it’s a bit unfortunate because there aren’t many good places to put a cube box. I whine about Fowers Games‘ products for the same reason, though, so it’s fine. Some players will not appreciate the luck factor. A lot of this game is luck (some is smart dice placement), which may not sit well with a lot of players. If you want high strategy, maybe not this game. If you’re looking for a high-conflict quick dice-chucking game, definitely this game. Apparently the casinos used to be named, and they lost their names in this version. That’s a nice bit of theme that has now disappeared, which is sad! The only way to really rectify this is to name the casinos yourself. Please make suggestions in the comments, keeping in mind that one of the original casinos was named the Bajazzo. Overall? The Vegas Dice Game is a great little dice game (especially for $20!). It’s simple and straightforward, which is always nice, but it’s also at a solid price point that makes it a great gift (or, a great gateway game, if you’re trying to get people into more complex fare). I like the components, I enjoy the tension, and even though there’s direct conflict, it’s more in an area-control sense than a “take-that” sense. Sure, it’s a dice-chucker, so it’s going to have a pretty large luck element, but if you’re looking for a short game in that vein (similar to, say, Dragon Slayer), I’d recommend checking this one out!